"Win assorted gift cards just in time for Black Friday!" Welcome to the Black Friday Gift Card Giveaway hosted by Generations of Savings and Beauty Brite! We have teamed up with a fabulous group of blogs to offer our readers an amazing 'Spree' just in time for Black Friday! 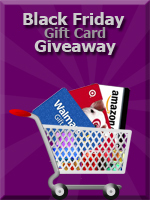 Enter to win: $100 worth of giftcards to Amazon, Target, and/or Walmart. Winner's choice of an assortment like $50 Amazon, $25 Target, and $25 Walmart or $100 from one. Please enter on the form below. Comments will not count as entries, but can be used for questions only. You only need to enter once on any of the participating sites. The form is the same on all of the blogs. This giveaway is open WW and will start Wednesday, 11/9 at 12:01 am and end on Wednesday, 11/23 at 12:01 am.